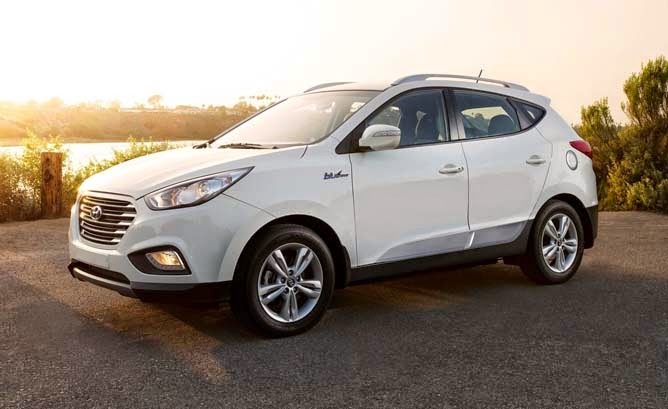 It’s not the first time a car with no internal combustion “engine” won Wards Auto’s prestigious 10 Best Engine award, but Hyundai’s Tucson fuel cell vehicle is the first hydrogen powered car to win in 21 years of the award. The Nissan Leaf won it in 2010, and this year BMW’s i3 also garnered the recognition – by virtue in no small part of its range extending engine, said Wards. But Wards said after weighing the choice, the Hyundai limited-availability FCV was recognized. Serious consideration was given to the meager infrastructure for hydrogen refueling and the vehicle’s availability in California only. But Hyundai engineers have done a stunning job packaging a fuel-cell stack under the hood to convert hydrogen into electricity to turn the wheels with ease. The 5-passenger Tucson FCV is powerful, quiet and, in a good way, completely ordinary. Pop the hood, and the fuel-cell stack even looks like a combustion engine. It’s as if this CUV was delivered from another galaxy by ingenious extraterrestrials who know how to make an Earthling feel right at home behind the wheel. As emissions and fuel-economy regulations ramp up, every automaker likely will develop fuel-cell vehicles. Hyundai is ahead of the curve. The fuel cell vehicle also benefits in that it’s a crossover SUV. Hyundai has been extremely bullish about the relative advantages of fuel cell cars, and has followed Honda’s FCX Clarity to market. Hyundai does not break out monthly sales from its internal combustion Tucson. The vehicle’s $499 lease price plus taxes and fees with $2,999 down includes the hydrogen and maintenance. Range is an estimated 265 miles.